Nice to see these two buddies partnered up on another(?) (I think so) crossword. It’s a cute theme that messes with the standard ban on repeating answer words. We’ve got a PAT of butter in the top center, a PLATE in the bottom center, three differently clued PANCAKEs stacked between the butter and the dish, and two brands of sham syrup dripping (roughly) down the side of the stack of flapjacks. 21a. [Kind of makeup], PANCAKE. 56a. [Breakfast food item], PANCAKE. 27d. [Syrup brand], AUNT JEMIMA. 29d. [Syrup brand], HUNGRY JACK. You know what would taste better? If you had real MAPLE SYRUP down both sides of the PANCAKE stack. Aunt Jemima, Hungry Jack, Vermont Maid, and other brands of “pancake syrup” or “breakfast syrup” are, if you’ll excuse me, crap. They’re high-fructose corn syrup, regular corn syrup, natural and artificial flavors, preservatives, and whatnot. They don’t contain actual maple syrup. I grew up eating the fake stuff and thinking the real stuff was gross, but I made the transition to nice, dark maple syrup and can’t go back. Lots of 9s in this grid with left/right symmetry. I like ’em all: STAYS SANE, “SHE’S A LADY,” C’EST LA VIE, PENNY LANE, TEXAS FLAG (which feels like more of a crosswordable state flag than most of the others—it’s certainly more iconic than, say, the North Dakota state flag), IN TROUBLE, and the SEVEN SEAS. Least favorite entry: 51d. [Fishhook line], SNELL. Mighty obscure. Tough section of the grid to wrangle, with PANCAKE and PLATE there. Other entries were meh, too, such as UTE RABE ETO OBI. I’ve got half a mind to swing by IHOP tomorrow on my way home from the gym, despite their syrup not being real maple syrup. Thanks for tempting us all with massive carbs, Patrick and Tony! 3.75 stars from me. Four types of boats are found backwards inside of other phrases. To help you find them, the four boats are identified elsewhere in the grid. 17a [Sight on many a nightstand] CLOCK RADIO hiding 21a ARK. 28a [Increase student competitiveness, perhaps] GRADE ON A CURVE hiding 43a CANOE. Love this one! Not only is the phrase very in-the-language and evocative, the boat is five letters long and spans four words. Very nice find indeed. 46a [They do the work of the lord] TENANT FARMERS hiding 29d RAFT. 61a [Stills from YouTube videos, e.g.] FRAME GRABS hiding 49d BARGE. Another good five letter boat, but the phrase is much less common. I wasn’t sure about this theme at first, but it definitely grew on me, and like I said, that CANOE entry is wonderful. The WSJ can do circles in their puzzles now (as evidenced by yesterday’s grid), but I think it’s nicer when the hidden words are identified separately — at least, in easier puzzles, and as long as they don’t impinge too much on the rest of the fill. In this case, I don’t think they did. Speaking of fill, PLEASE RISE and especially ALL-ATINGLE are fantastic entries. And the slew of sixes and sevens aren’t bad either (SECONDS, TOREROS, EARLESS, IMMERSE, TONGUE, ONE-MAN, CUT OFF, CARAFE, and TYRONE). Also, I just love the word USURP. Can you think of any other common English words with a starting long U that is its own syllable? ROEG [“Walkabout” director Nicolas] was about the only rogue entry that got my eyebrows up. 16a [In addition]. ELSE. I balked at this thinking it should have been ALSO. But when you think of a question like, “Is there anything ELSE you need?” it makes more sense. 15d [Arbiter of good taste?]. TONGUE. 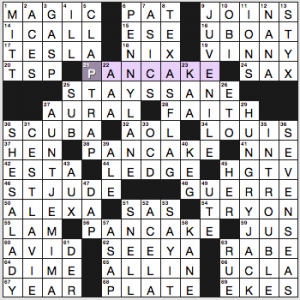 Oh, are we supposed to be licking crosswords now? 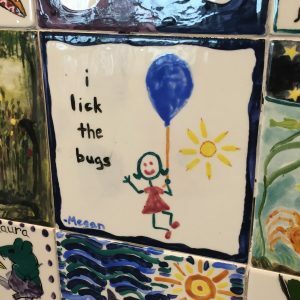 Reminds me of a painted tile (clearly done by a child) that I saw at Seattle’s Pacific Science Center. Some of these NAMEs (94D) were harder for me to, uh, name than others were, but these were all pretty clever uses of final syllables to create a theme on this scale, and the actual echo portion was well-clued enough to fill in the blanks I had. If you give me ACK-ACK-ACK in the grid, this is where my brain goes. The theme on this one is great, but some of the cluing choices let me down a little bit. On a fill level, the start of the puzzle was a little abbreviation-heavy (INST., HORT., and RPM, all in the starting row! ), and something just looks incorrect to me about the word VISAED. I’m not familiar enough with the MIT Media Lab (are any of us?) to be able to know that their director Joi’s last name is ITO – I’d have actually preferred a reference to judge Lance there. I liked THREE ON TWO and MELODICA in the downs, as well as the fakeout on “Manhattan school” being KSU, not NYU as I first thought. EASTER EPIC is a nice bit of fill, but a 31-year-old hockey game is so out of my knowledge range that I needed a lot of crossings. 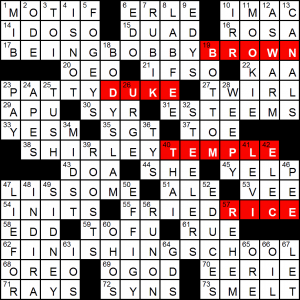 The puzzle theme is all neat and tied with a bow.I initially thought the crossword was going to be a BBB theme at BEINGBOBBYBROWN, but was quickly disabused. FINISHINGSCHOOL is the opposing spanning answer indicating that four other across answers’ final words are American universities. I know there a lot of American colleges out there (endless U?? 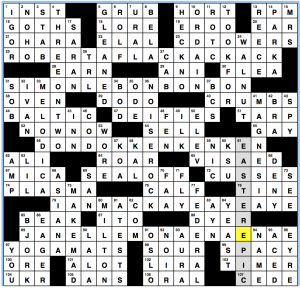 debacles in crosswords have taught me this only too well), but this feels a pretty elite set, and there aren’t too many more that are known by one name that could have been used; universities like Yale and Harvard aren’t found in unrelated phrases for the most part. The puzzle didn’t get on my good side initially: playground phrases are cringily contrived, and starting with ISNOT crossing IDOSO is crying out to be redone or at the very least reclued. It settled down after the rough start for the most part, though I can imagine people who have some how not read the short story collection or iconic Disney film and aren’t baseball fans balking at MOOKIE/KAA. How many people called MOOKIE are there in America-land? I know MOOKIE/Blaylock was a NBA player that was also the original name of rock group Pearl Jam. Two famous Mookies seems so improbable! This entry was posted in Daily Puzzles and tagged Daniel Hamm, Frank Virzi, Mike Shenk, Patrick Blindauer, Tony Orbach. Bookmark the permalink. USUAL and UVULA spring to mind! Ubiquitous and Ukulele. Also the proper nouns Uganda and Ukraine. Great examples! Although I’m not sure about ukulele. Without looking it up, I want to say the correct pronunciation is more like “oo-koo-lay-lay.” But certainly the Americanized pronunciation employs the long U. My mother was Canadian, so we put brown sugar on our pancakes. When we had some fake syrup, it was Log Cabin, which came in a delightful cabin-shaped tin container, which was the best thing about the syrup. When I was growing up, each year we would to go Monterey, Va, where there is an annual maple syrup festival where we would line up to get pancakes and locally made maple syrup – there is a tour where one can see (and smell!) it being made – as much syrup as we could stand to eat, which for me as a child, was a LOT. I don’t do that anymore, but wow, was it good. Where are you getting the LAT puzzles this week? I haven’t been able to find them on the cruciverb,com web site link from Crossword Fiend since Monday. Those both worked when I tried them just now. Thanks for your suggestions. I can get to the sites but am having trouble printing the format they are in. I guess I’ll have to wait until the across lite version comes back. At Costco the other day; discovered they’re selling maple syrup that’s been aged in bourbon barrels. The stuff was *SPECTACULARLY* good. Seriously, if you see it, plunk down the dough (it wasn’t cheap but not absolutely outrageous) on a bottle. Oh my god. I am a maple syrup snob — won’t let Log Cabin et al in my house — and this was amazing. Anyway, fun puzzle! And a nice way to break the no-duplicate-answers rule. Probably been done before, if not with this word, but this was nicely done. Given that Texas’s Lone Star flag so recognizable (a look at Sporcle’s US State Flags quiz showed California and Texas as easily the most-correctly-guessed answers), that didn’t feel like a roll-your-own at all to me. AVCX: This puzzle had a very high concentration of music and sports-related things I didn’t know, even besides the theme entries. The crossing of a volleyball player with a bass player was tough, although I guessed the letter. Same with the soccer player/Phoenix Suns coach. The Zeppelin tune answer I have doesn’t make sense, but perhaps I have a mistake there. I like learning these things, but I felt like this was a bit of information overload. That said, I thought the theme was excellent and quite clever. I got it immediately from 25A, and it was of much help in getting other answers. Definitely was an accurate difficulty rating (for me, at least). So, tough but fair, I guess. On the AVCX: Ian MacKaye’s father Bill was for many years the editor of the Washington Post Magazine Crossword. Every few years in my 20’s I’d go into town and have lunch with him, which was a thrill. AVCX: The EASTER EPIC was during a first-round playoff series, not the “Stanley Cup final” as the clue states. 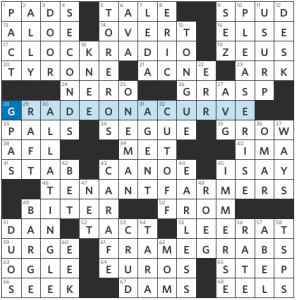 And though I surely remember the game, that’s quite the obscurity to use in a crossword in 2018. Tip of the hat to Brendan Quigley and the AVCX team for 60/40 gender parity, which is as close to 50/50 as you can get with 5 theme answers. Tough solve, but I like a mid-week challenge. Started with a stumble of sorts: ROBERTAFLACKsflACK, but sorted it out once I saw the reduplicate pattern.